This work of the famous Russian painter, Isaac Ilyich Levitan, is nothing more than a simple pastel sketch from the artist’s etudes series. But how, however, amazes us the naturalness, dynamism, and, most importantly, the completeness of this picture! The composition of the picture is very successful, a small strip of land separating two raging elements – water and heavenly. The sky occupies as much as two-thirds of the sheet, so the entire emphasis is on it, on its dynamics and scale. The surface of the water is restless and pockmarked, great thunderclouds bent low over the ground; they are slightly crushed, which creates the illusion of movement: the clouds, as if with incredible speed, are driven by a strong gusty wind. In some places you can notice the sun glare: a yellowish land area, the front part of the cloud, it dilutes the landscape, gives it a vividness, a feeling of variability, that it happens at this particular second. Somewhere the blue and clear sky peeps, but the clouds are so dense that a storm seems inevitable. The whole picture is permeated with anxiety, a sense of impending storm. The torrential rain is about to fall! The ripples of water are very naturally transmitted, and the sky is very accurately reflected in it. In the left corner of the picture you can see a small, lonely willow twig – it swings, struggling to resist the onslaught of the wind. The colors of the picture emphasize its drama, giving depth. Saturated blue, gray tones of water, heaven, dark green, almost black forest in the distance, and light gray, blocking sunlight, thunderclouds. 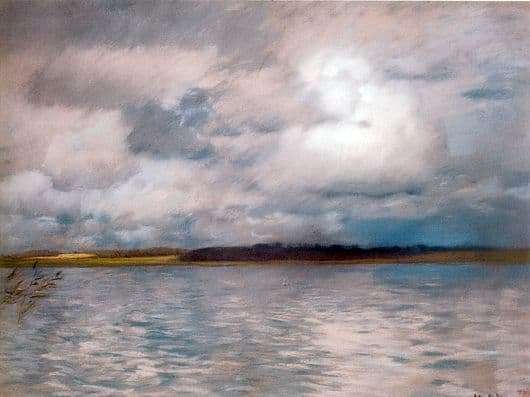 All this creates a very emotional and expressive appearance of a simple outline of Levitan and shows his amazing skill in the ability to catch and convey the changeable state of nature!